Visit the Baratang Island, travel through the Jarawa Tribal Reserve, trek to the limestone caves, take a boat ride across the Andaman Sea and visit the mud volcanoes. The trek itself begins after you an AC bus picks you up from Port Blair and drives through the Jarawa Tribal Reserve. When the road ends, you'll take a fiber boat ride to Baratang Island and trek to the limestone caves and mud volcano. This adventure-packed, relatively easy trek gives you the chance to explore the tropical beauty of the Andaman Islands over a short day trip. Baratang Island is everything that defines the sun, sea and sand experience of the Andaman Islands. 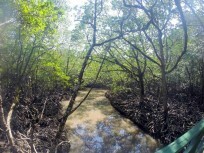 Despite being the home of pristine beaches, tropical jungles, chirping birds and beautiful mangroves, Baratang Island remains a little-known destination in the Andamans belt. Your destination on this trek, the limestone caves are located deep in the forest, close to the coast. The caves feature unusual formations of rock, made from the minerals of limestone and calcite. • Travel through the Jarawa Tribal Reserve. • Trek to the Baratang Island's limestone caves. • Hike over a trail through deep, summer rainforests. • Take a fiber boat ride across the Andaman Sea. The trek takes you through the Jarawa Tribal Reserve, home of the native Jarawa tribe. Travellers are prohibited from taking photographs inside the Jarawa Tribal Reserve. 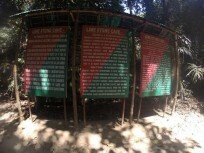 Consumption of alcohol, drugs, tobacco products and cigarettes is strictly prohibited during this trek to Baratang Island limestone caves. 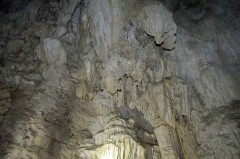 Travellers are required to follow instructions of the trek leader during this trek to Baratang Island limestone caves. All cancellations made 15 days or more before the scheduled Baratang Island limestone caves trek: 50% refund. All cancellations made less than 15 days before the scheduled Baratang Island limestone caves trek: no refund. The pick-up AC bus will pick you up from several different pick-up locations around Port Blair. These locations include: Aberdeen Bazaar, Phoenix Bay, Marine Jetty, Goal Ghar, Junglighat, Dairy Farm Junction, Bhatu Basti and Sippighat. The tour operator takes utmost care to ensure safety of the travellers and shall not be held responsible for any mishap, accident or loss of life during this trek to Baratang Island limestone caves. The tour operator reserves the right to cancel or alter the itinerary of this trek to Baratang Island limestone caves due to any unforeseen circumstances like bad weather. Any extra costs incurred due to such changes are borne by the traveller. Go on a trek to Baratang Island limestone caves! You'll be picked up from several designated pick-up locations in Port Blair at 03:30 hrs. In an AC bus, you'll travel north from Port Blair over a highway that leads through the Jarawa Tribal Reserve. A 2-hr drive later, you'll reach the Middle Strait jetty. A ferry service from the jetty takes you across the sea towards Baratang Island. You'll touch ground again at the Oralkatcha jetty. Begin trekking from the jetty towards the limestone caves. After a 3-hr trek, you'll reach the limestone caves. Spend an hour exploring the caves and begin retracing your steps back to the jetty. You'll return to Port Blair by taking the same route: ferry back to Middle Strait jetty and AC bus journey back to Port Blair. Your trip ends here. Visit Baratang Island and trek to the island's limestone caves! Pick-up will be arranged from multiple designated spots in Port Blair by 03:30 hrs. A packed lunch in included in the meal package, served en route to the Baratang limestone caves. Port Blair is well-connected to most major cities of the world via frequent flights to Port Blair's Veer Savarkar International Airport. You'll be picked up from several designated pick-up locations in Port Blair. These include: Aberdeen Bazaar, Phoenix Bay, Marine Jetty, Goal Ghar, Junglighat, Dairy Farm Junction, Bhatu Basti and Sippighat. The tour operator will arrange your transport to the start point of the trek to Baratang Island limestone trek.